A lot of my time in Dublin’s city centre is spent along its quays. 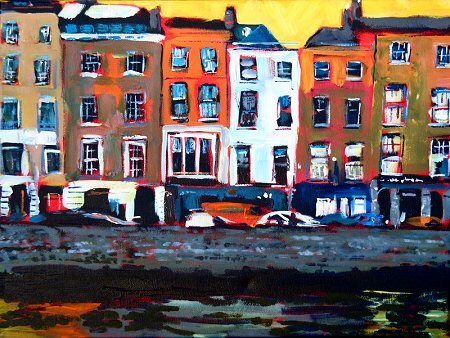 This painting is the view from the southside - from where Essex quay runs into Wood Quay - of Ormond Quay Upper on the northside. If you’re not good on names it’s just after the green bridge where the boardwalk finishes. Sin É is over there and maybe you might catch me in there some night. Late. Very late. If you’re known to me you could always pay me direct and save me the processing fees. Direct means personal cheque/check, account transfer, or that stuff called cash. Ormond Quay Upper, Sin É is now SOLD. The painting Ormond Quay Upper, Sin É continues around onto all 4 sides, which are 0.75″ wide. See other paintings available for sale - paintings are added to and withdrawn from this page regularly as they become available for sale and are sold. There’s also a page of paintings of Ireland and elsewhere most of which are sold.